The most popular network protocol in the world, TCP/IP protocol suite, was designed in 1970s by 2 DARPA scientists—Vint Cerf and Bob Kahn, persons most often called the fathers of the Internet. 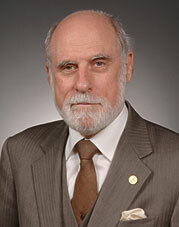 Vinton Gray "Vint" Cerf (born June 23, 1943 in New Haven, Connecticut) obtained his B.S. in Math and Computer Science at Stanford University in 1965 and went to IBM, where he worked for some two years as a systems engineer, supporting QUIKTRAN—a system to make time-shared computing more economical and widely available for scientists, engineers and businessmen. In 1967 he left IBM to attend graduate school at University of California, Los Angeles (UCLA), where he earned his master's (in 1970) and PhD degree (1972) in Computer Science. During his graduate student years, he studied under Professor Gerald Estrin, worked in Leonard Kleinrock's data packet networking group that connected the first two nodes of the ARPANet, the predecessor to the Internet. He worked as a Principal Programmer, participating in a number of projects, including the ARPANet Network Measurement Center, a video graphics project including a computer-controlled 16 mm camera, development of ARPANet host protocol specifications. While at UCLA, he also met Bob Kahn, who was working on the ARPANet hardware architecture in Bolt Beranek and Newman. 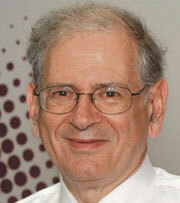 Robert Elliot Kahn (born December 23, 1938) received a B.E.E. degree from the City College of New York in 1960, and M.A. and Ph.D. degrees from Princeton University in 1962 and 1964 respectively. After graduation, he received a position in the Technical Staff at Bell Labs and then became an Assistant Professor of Electrical Engineering at MIT. He took a leave of absence from MIT to join Bolt Beranek and Newman, where he was responsible for the system design of the Arpanet, the first packet-switched network, and was involved into the building of the Interface Message Processor. In 1972, Kahn was hired by Larry Roberts at the IPTO to work on networking technologies, and in October he gave a demonstration of an ARPANet network connecting 40 different computers at the International Computer Communication Conference, making the network widely known for the first time to people from around the world and communication engineers realizing that packet switching was a real technology. Network connectivity. Any network could connect to another network through a gateway. Distribution. There would be no central network administration or control. Error recovery. Lost packets would be retransmitted. Black box design. No internal changes would have to be made to a network to connect it to other networks. 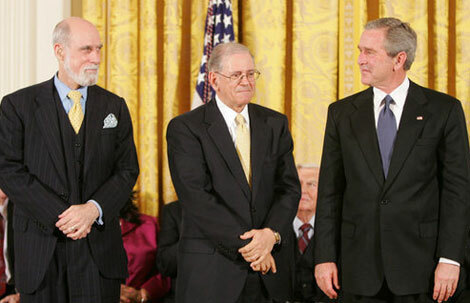 In the spring of 1973, Vinton Cerf joined Kahn on the project. They started by conducting research on reliable data communications across packet radio networks, factored in lessons learned from the Networking Control Protocol, and then created the next generation Transmission Control Protocol (TCP), the standard protocol used on the Internet today. In the early versions of this technology, there was only one core protocol, which was named TCP. And in fact, these letters didn't even stand for what they do today Transmission Control Protocol, but they were for the Transmission Control Program. The first version of this predecessor of modern TCP was written in 1973, then revised and formally documented in RFC 675, Specification of Internet Transmission Control Program from December 1974. During the development of TCP, Cerf and Kahn used the concepts of CYCLADES, a French packet switching network, designed and directed in 1973 by Louis Pouzin. It was developed to explore alternatives to the ARPANET design and to support network research generally. CYCLADES was the first network to make the hosts responsible for the reliable delivery of data, rather than the network itself, using unreliable datagrams (Pouzin coined the term datagram, by combining the words data and telegram) and associated end-to-end protocol mechanisms. What is the current status of Internet Protocol Suite (commonly known as TCP/IP)? It is the set of communications protocols used for the Internet and other similar networks. It is named from two of the most important protocols in it: the Transmission Control Protocol (TCP) and the Internet Protocol (IP), which were the first two networking protocols defined in this standard. Today's IP networking represents a synthesis of several developments that began to evolve in the 1960s and 1970s, namely the Internet and LANs (Local Area Networks), which emerged in the mid- to late-1980s, together with the advent of the World Wide Web in the early 1990s. The design of the network included the recognition that it should provide only the functions of efficiently transmitting and routing traffic between end nodes and that all other intelligence should be located at the edge of the network, in the end nodes. Using a simple design, it became possible to connect almost any network to the ARPANet, irrespective of their local characteristics. One popular saying has it that TCP/IP, the eventual product of Cerf and Kahn's work, will run over two tin cans and a string. A computer or device called a router (a name changed from gateway to avoid confusion with other types of gateways) is provided with an interface to each network, and forwards packets back and forth between them. Requirements for routers are defined in RFC 1812. DARPA then contracted with BBN Technologies, Stanford University, and the University College London to develop operational versions of the protocol on different hardware platforms. Four versions were developed: TCP v1, TCP v2, a split into TCP v3 and IP v3 in the spring of 1978, and then stability with TCP/IP v4—the standard protocol still in use on the Internet today. In 1975, a two-network TCP/IP communications test was performed between Stanford and University College London (UCL). In November, 1977, a three-network TCP/IP test was conducted between sites in the US, UK, and Norway. Several other TCP/IP prototypes were developed at multiple research centers between 1978 and 1983. The migration of the ARPANet to TCP/IP was officially completed on January 1, 1983, when the new protocols were permanently activated. In March 1982, the US Department of Defense declared TCP/IP as the standard for all military computer networking. In 1985, the Internet Architecture Board held a three day workshop on TCP/IP for the computer industry, attended by 250 vendor representatives, promoting the protocol and leading to its increasing commercial use. The Internet Protocol Suite, like many protocol suites, may be viewed as a set of layers. Each layer solves a set of problems involving the transmission of data, and provides a well-defined service to the upper layer protocols based on using services from some lower layers. Upper layers are logically closer to the user and deal with more abstract data, relying on lower layer protocols to translate data into forms that can eventually be physically transmitted. The TCP/IP model consists of four layers, as it is described in RFC 1122. From lowest to highest, these are—the Link Layer, the Internet Layer, the Transport Layer, and the Application Layer. It should be noted that this model was not intended to be a rigid reference model into which new protocols have to fit in order to be accepted as a standard. Almost all operating systems in use today, including all consumer-targeted systems, include a TCP/IP implementation.